In January of 2010 I wrote a blog laying out some lofty goals for the year 2010 Blog. Now, often people write in January how they are going to share their results for the year, but as soon as things go south, they don't want to talk about it anymore. I'm not that guy. I'm more than willing to point at my failures just as often as my successes, and 2010 saw me miss my goals by a large margin. 1. $1 million in tournament earnings in 2010. Well that didn't happen. I didn't get that big score I needed to cross the $1 million mark and finished the year with $683,825 in cashes. The goal in 2011 remains the same, and I'm very confident I'll be able to achieve this goal, starting out with some big events at the PCA in just a few days. 2. Stay #1 on the all-time money leader list. Phil Ivey played a full slate of tournaments in 2010 and walked away with a WSOP bracelet to boot. That's a big hole to jump out of in 2011, as Ivey is once again expected to play a full schedule, but I'm a big believer in setting your goals high, so the goal is to get back on top the all-time money leader list. 4. Two WSOP Bracelets. Never mind two bracelets, I barely got a sniff at one. I came 8th in 2-7 NL Single Draw, 10th in the $25k NLH 6 max, and then had a shot at WSOPE making the quarter-final of the heads up event there. The goal in 2011 is still two bracelets, but I won't exactly be crying if I "only" win my 5th. 5. One Tour Win. The closest I came here was EPT Vienna. Ironically, I hadn't had much success on the EPT until this season, having my first ever cash at the previous stop in London, but I was disappointed with the 4th after holding the chip lead from the middle of day two all the way down to the final 4. I felt like I let one slip away here and should have posted a better result. Lot's of events to choose from in 2011 with the EPT, WPT, and NAPT, as well as possibly getting out to an LAPT or an APPT event... that's a lot of PT's! The goal is a win. 6. Move up to 12th on the WSOP all-time cash list. Ding, ding, ding, don't call it a shutout! With 48 cashes I moved into a tie with Brent Carter and Mike Sexton in 12th place. The goal in 2011 may seem like a modest one, but it's the only one that is realistically attainable, and that's to move past John Cernutto (49) into 11th place on the all-time list. Sitting in 10th is John Juanda who has 55 cashes and rates to cash at least 4-5 times which would force me to cash 12 times to move in the top ten. Yeah, not betting that one! 7. 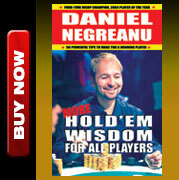 Move up to 25th on the WSOP all-time money list. I started the year in 28th place, and ended the year in 31st! So yeah, that's a fail. While I may have caught a few people I was chasing, the big prize pools in the main event shoots guys up the list in a hurry, so the goal this year is to bump past Antoine Saout and Scott Montgomery into 29th place. It's an incredibly difficult goal actually, because realistically I'll have to also catch either John Juanda or Chris Ferguson as well, who are currently about $500k ahead of me. 8. Get to the $3-$6 level in my bankroll challenge. I am not dead yet, but I didn't have the time to really put in enough volume to reach the $3-$6 level. I'm currently at the $0.25-$0.50 level with $163.45 after starting with $10 at $0.01-$0.02. In total I've played 7244 hands, one tabling the whole time. I had my bankroll up to $250, but some bad luck at my current level has put me in jeapoardy. I plan on playing a lot more high stakes poker online this year, so I'll leave this goal the same, hoping to get to the $3-$6 NL game without going broke. 9. 60,000 VPP's on PokerStars. For most of you grinders this may seem like an easy feat, but the most I've ever gotten in a year, last year, in fact, was about 55,000. You earn 550 VPP's for playing $5600 sit n' gos which should help. I've already played 8 matches and have been fortunate so far, going 6-2. 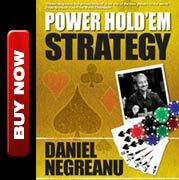 I also plan on playing a lot more high stakes limit hold'em, another way to earn points fast. Multi-tabling is also an option I'm looking into, and practiced a session 4-tabling heads up at $5-$10 stakes. I played 1038 hands, never timed out or sat out, and ended up winner, but my brain was mush. I have a long way to go before I could endure taking on the SuperStar Showdown again Isildur1. I plan on continuing to practice, and hopefully take him on one Sunday. I really enjoy watching him play, and thought the match vs. Tony G was very entertaining. 10. Win $250,000 or more on televised cash games. That will include any tapings of PokerStars.Net The Big Game that I play, as well as High Stakes Poker in 2011 (the session I played in December will not count.) This one is guaranteed to get some chuckles from forum posters and those that have seen me donk off more than a few buy ins on TV, but I feel it's very doable provided I play at least 8 sessions. So to make that clear, I'm not talking about one single session, I'm talking about the total at years end. I would also play on Poker After Dark's cash games happily, and PokerStars totally allows our Team Pros to take part in shows sponsored by our competitors, but I was told I would not be allowed to participate on the show which I think is unfortunate, especially for the fans. I'm pretty sure both the players and the fans are sick of the politics associated with sponsored shows/tournaments and would all like the freedom to choose which events they play, within reason. Just to make things clear, PokerStars policy is to allow players of any affiliation play in their tour events, as well as shows like The Big Game. In fact, players like Durr and Phil Ivey were invited to take part in both The Big Game and HSP, but were not allowed to participate. So there are my 10 goals. If I hit 5-10 I'll consider it a great year... 1-10, and I may join the ranks and not post a blog with my results in 2012! Kidding of course, expect to see my yearly goals blog for as long as I'm playing poker. Briefly, New Years Eve was an absolute blast. We had a decent group of about 20 people for dinner at Little Buddha. Then our host took us to a prime table at Moon where LMFAO performed. Everyone was into it, and I had a blast with some of my closest friends. Jennifer and Marco, my assistant Patty and her fiance Lisa, Stapes and Parker, Eddy flying solo, Sam and my Korean buddy John Smith (funny story how he got that name), my golf guy Christian and his wife Amy, Lex and Evelyn, and of course, no party is complete without Amanda and her sidekick Jeska. The plan was to head to Rain, but that changed last minute and our "guy" Lance Sherman hooked us up with a bus to meet some friends. We danced there for a while, and then moved the party to the Penthouse suite at Palms Place that I rented out for two nights. Place is pretty sweet. We had a hot tub on the balcony and didn't get to bed until I was good and wrinkly from chillin' out there till the sun came up. Almost forgot, pro pool player Alex Pagulayan joined us after dinner and ended up sleeping in a chair. He's so tiny he fit his whole body in the smallest chair ever! Must have been about 8 of who ended up sleeping in the suite, but Alex was certainly the most space efficient. The next two days were total veg days. We didn't leave the suite on Jan 1st and did a whole lot of nothing! Yesterday, everyone headed over to my house to watch ridiculous movies and eat fast food. It took my hot tub almost 6 hours to heat up, and when it did it started snowing in Vegas! A little snow wasn't going to stop anyone though... except me. I left Canada because I hate the cold!